Brandon Graham is the villain of Tom Brady's worst nightmares these days. In the final episode of "Tom vs. Time," a six-part docuseries on the career of the legendary Patriots quarterback's, Brady confesses that the Eagles' critical strip sack late in the fourth quarter of Super Bowl LII has replayed again and again in his mind. "It was a five-point game with a chance to win the Super Bowl," Brady said, "with two minutes and twenty seconds left. I mean, I thought we were going to go down and score. I thought we were going to win the game. You know, the drive got started, and we gained yards. It was a second down play and it just happened so quick. And that's — you know, I thought about that play 500 times in five days. God, you know, what should I have done?" For Eagles fans, this becomes even more delightful when you recall that the sixth and final episode of "Tom vs. Time" had to be redone because it was originally filmed before the Super Bowl and had assumed the Patriots would win. Last month, Brady expressed gratitude to the Eagles for bringing out the best of him and his teammates in Minneapolis. The 40-year-old quarterback has still not congratulated Super Bowl MVP Nick Foles for his accomplishment. 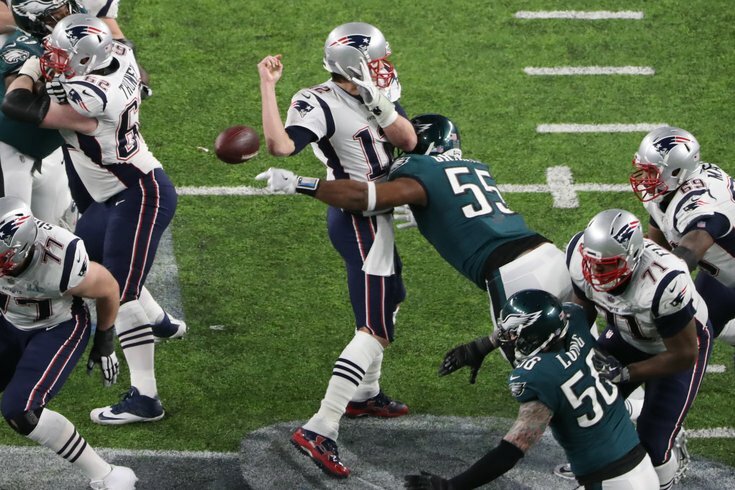 As for Brandon Graham, seizing on Brady's lack of pocket awareness in that moment will reign as the highlight of his career.